This Clip Picture Frame can be Displayed Vertically or Horizontally! 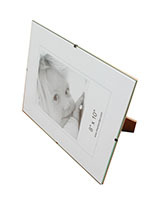 Portrait Displays are Available in Several Sizes from this Supplier! Each Clip Picture Frame is Inexpensive! 6" x 8" 8" x 10"
1/8" Tempered glass lens and 1/8" chipboard back are held in place by spring steel clips. 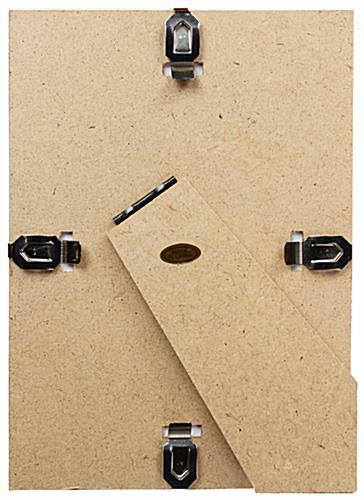 Easel backer and clips facilitate wall-mount or countertop display. 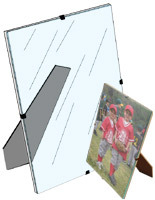 Dual sided easel for displaying vertically or horizontally. 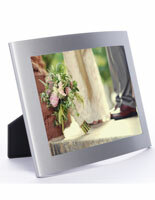 This clip picture frame is ideal for use in a home, office, or business. These glass photo displays are frameless for a look that will never go out of style. 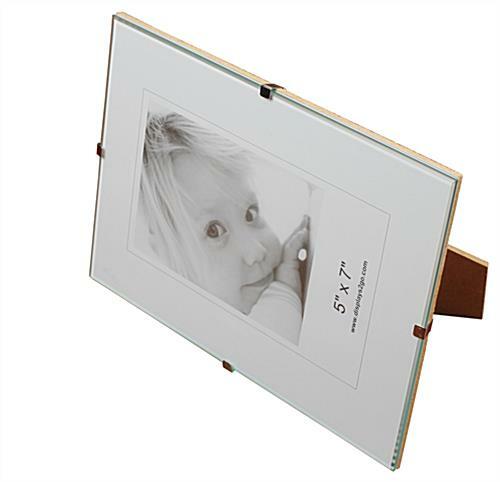 This clip picture frame makes a great gift. Users will often showcase children's art in these glass holders due to the low cost and stylish look. 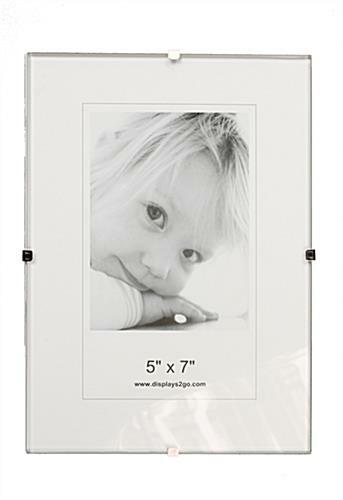 This 5" x 7" clip picture frame has steel spring clips that hold the glass panel and chipboard back in place. The front panel is made of tempered glass, which is much stronger and safer than traditional glass. 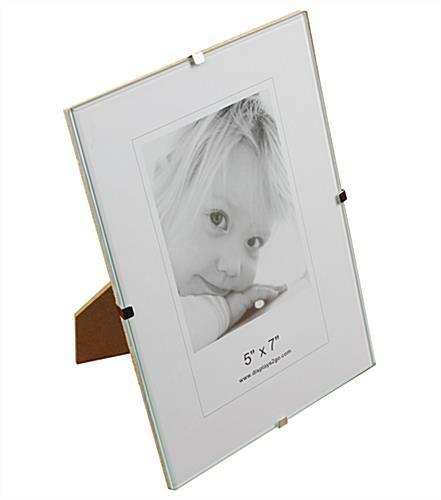 Each frameless portrait holder is a clip picture frame that has an easel backing for use on a desk. 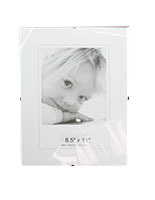 Users can also display these tempered glass photograph holders on a wall. Each photo display is a clip picture frame that has a tempered glass panel to protect the images from damage. Many other portrait holders on the market have an acrylic lens, which is not nearly as elegant or protective. 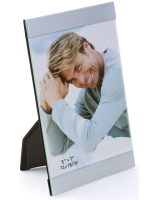 This print display is a clip picture frame that works in either vertical or horizontal format. These photo holders are not made with wall mounting hooks, however they can be hung using the steel spring clips. Each clip picture frame, known as a tempered glass photo display, can be used for showcasing a snapshot in an office or an ad in a retail store. Frameless print displays ensure that the prints will be the main focal point since there is no border on the edges. 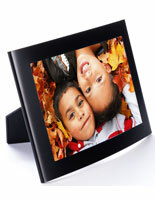 This clip picture frame is reasonably priced with the option to purchase in bulk at a greater discount. 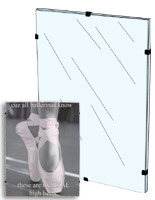 Buy frameless glass photo holders from this trusted retailer now. 5.1" x 7.1" x 0.25"
These frames were just what I needed for my project. They look great! They were shipped promptly and arrived safely! I will order from here again! I'm very happy with this purchase. Highlights the actual photo. These were not as nice in person as I thought they looked on the site. I would return but if end up spending so much on shipping and a lame 20% restock fee that it's not worth it. My husband is so disappointed in the look that he asked me to NOT gift our family photos in these frames. What a let down... Was hoping I could use this site for future purchases. I guess I'll have to stick to in store shopping for this kind of thing. We are very sorry that you were not happy with the look of your frames, Cleveland. A customer care representative will contact you shortly to resolve your issue. Works Like I thought it would. I wanted a lower price frames for several pictures I had to frame. Looks good and it is easy to install the pictures.